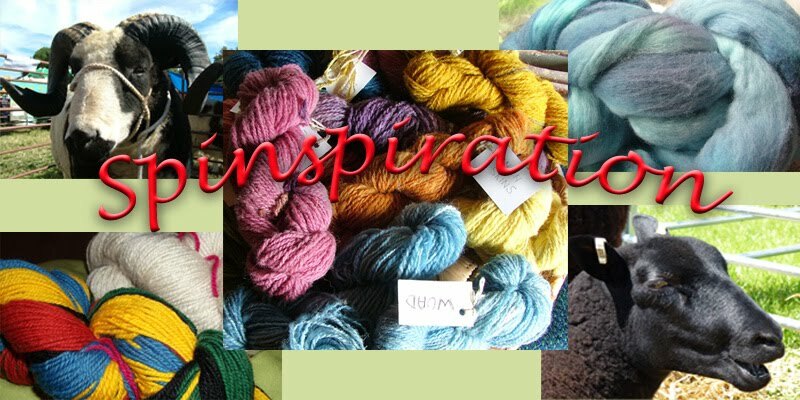 Hello, come and join us at Spinspiration and let us know what woolly adventures you have been having recently! 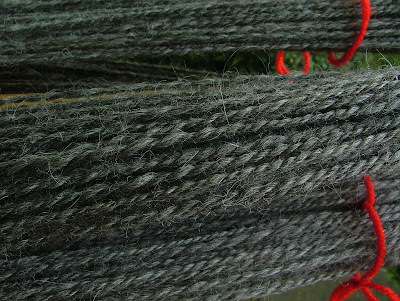 I shall start with an update to the Cotswold fleece I was spinning earlier this year. 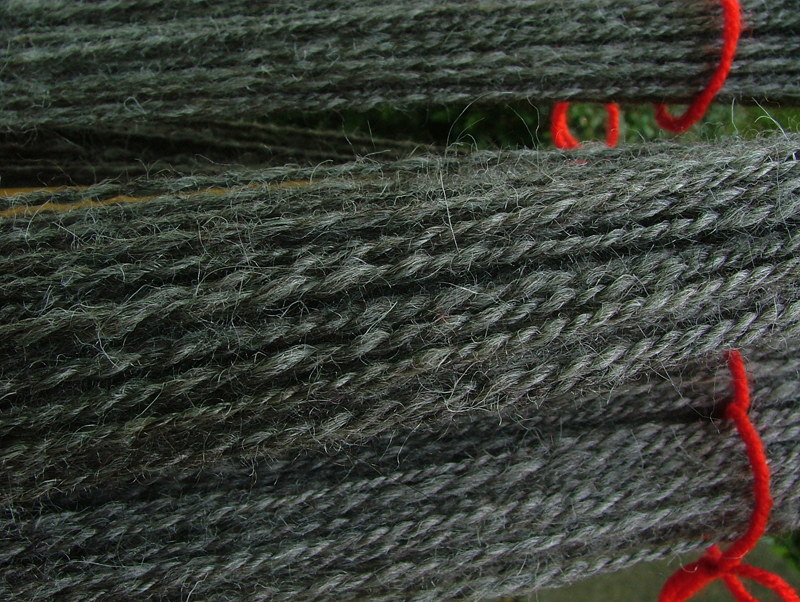 A lovely fluffy bundle of fibre sent to me by Kelly to try out this "new to me" breed. 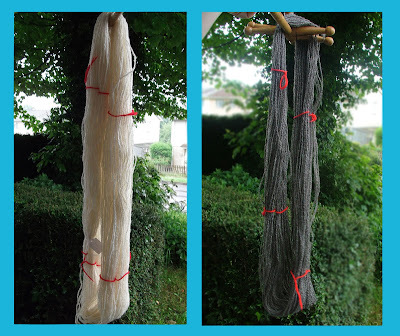 You can look back at previous posts for the spinning journey of this fibre, but here it is all plied and ready for a finishing wash.
perfectly balanced yarn - yay! 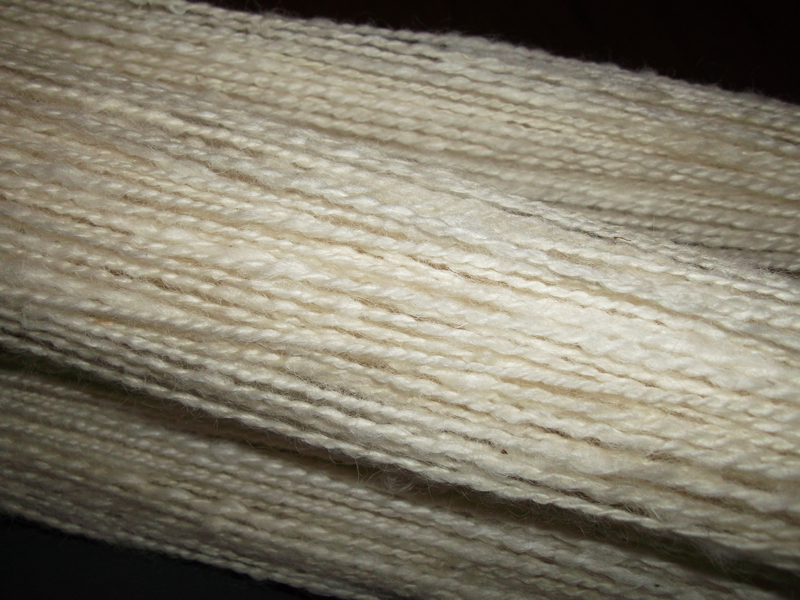 I'm rather pleased with how it has plied - it seems to have hidden those lumps and bumps and off the niddy noddy it was wonderfully balanced. I've also been playing a little with a couple of drop spindles which I have clicked with perfectly, after trying many and just not enjoying it much. 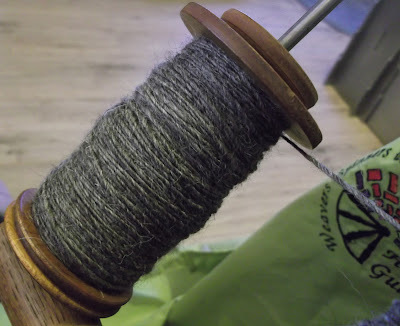 I prefer wheel spinning as it achieves a better balanced yarn for me and is so much quicker but having a drop spindle is handy to take out and about. 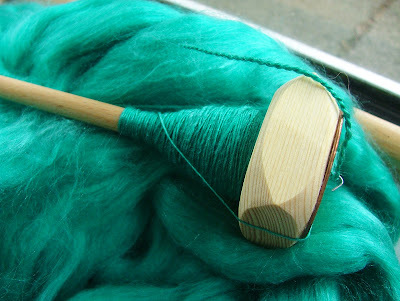 Here I am spinning a Teal blend of wool, silk and acrylic. So hard to get the picture to reflect the true colour. Spinning this very fine and hoping to use this eventually as a one of the plies in a yarn. I may just sample a few things to see how it would work best. Other spinning here recently has been some Masham wool I had. I just love the way these sheep look with their long curls. I spun 2 bobbins of singles on the Wee Peggy wheel, most of which I did whilst demonstrating with other Guild members at a local Historic working farm. An event on the calendar each year and one dear to my heart and spinning journey - my very first go on a wheel was here 3 years ago at this event, just a short time after my impulsive purchase of my first spinning wheel. Here I am spinning at the farm, I feel this was as a way for me to pay forward the wonderful opportunity to impart and teach the skills I love so much. 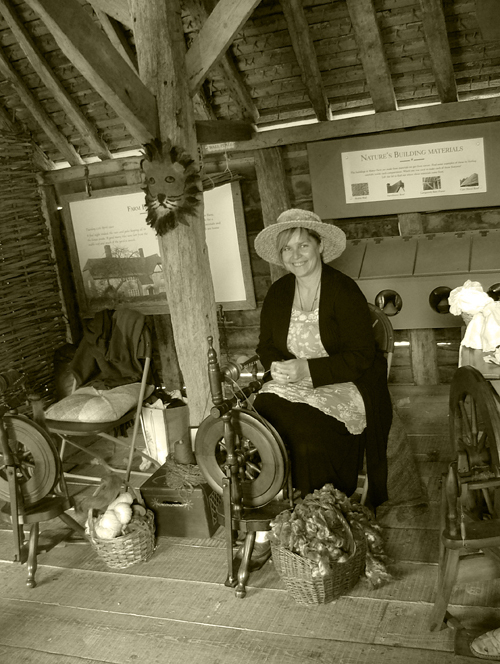 There were some lovely people to talk to, very interested in the whole process from sheep to yarn, and a few jumped at the chance to try a wheel - we had an Ashford Traditional there set up and ready for people to try out. We had a lovely day, although a little chilly at times in the Barn. 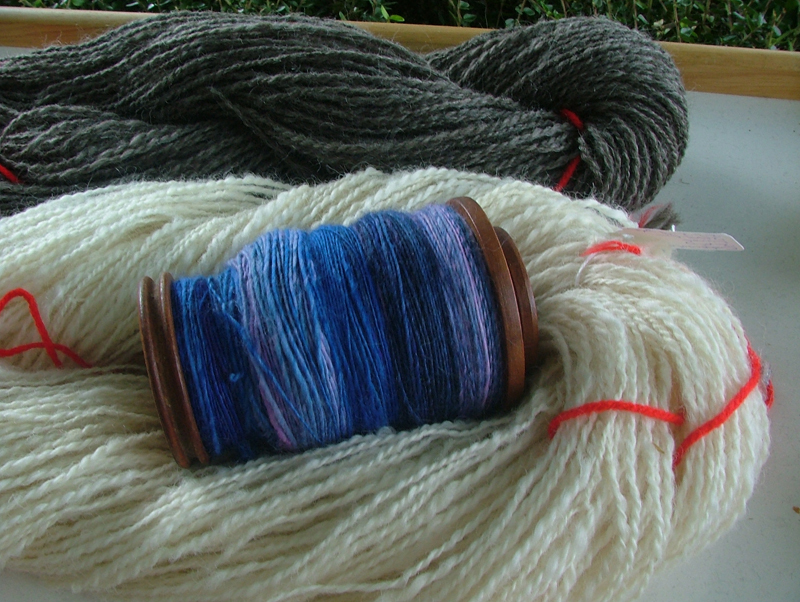 At home I plied the Masham singles - plied on the Louet, here it is in all it's glory. I am really pleased with this yarn, evenly plied and like the Cotswold above it is perfectly balanced - I do love it when that happens. Look forward to seeing other linked posts, don't be shy, come and let us know what you have been up to lately. Or are you just acquiring more stash with it being shearing time?